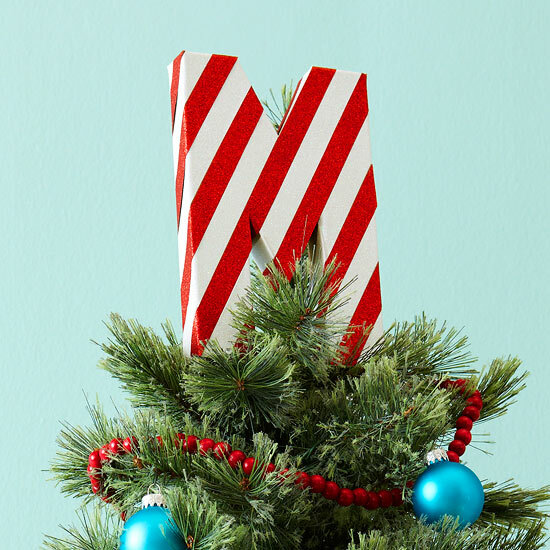 A wooden block letter is transformed into a creative tree topper with some paint and holiday-color ribbon. Paint your letter a desired color; let dry. Measure strips of glittery ribbon to fit across your letter and adhere in place using hot glue. 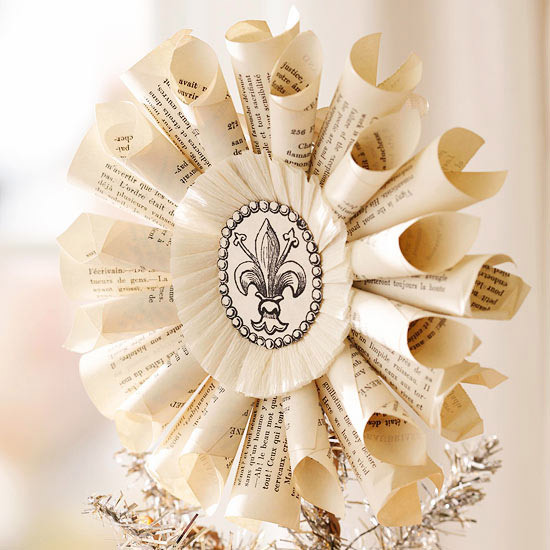 Secure a paper towel roll to the back of your letter with hot glue and slip onto top of tree. 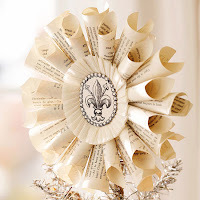 Rolls of old book pages come together in this pretty paper tree topper with a vintage feel. 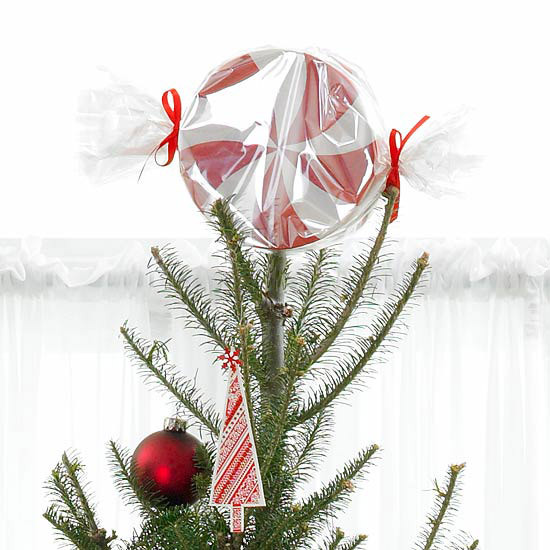 Add instant charm to your Christmas tree with this easy tree topper. Cut a star shape from thick paper or cardstock. 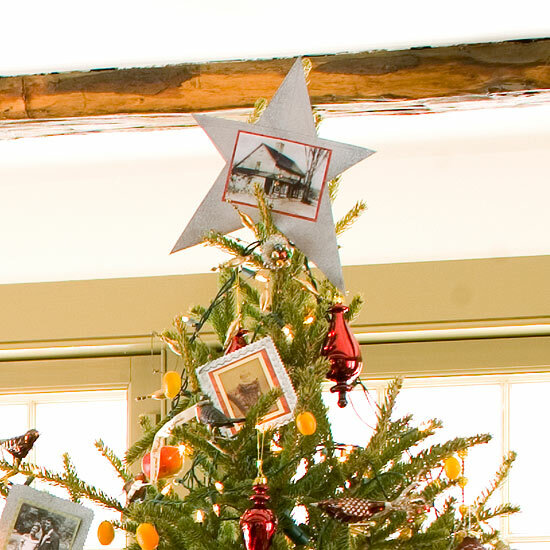 Cut out a black and white photo, mat it with colored paper, and glue it to the center of the star. Secure the star to a rolled paper cone or paper towel tube with glue, and carefully set your star on your tree's highest branches. This yummy tree topper makes for a sweet Christmas decoration. The fun red-and-white pattern will fit in with any decorating theme. An unused black hat makes the perfect addition to your Christmas tree. 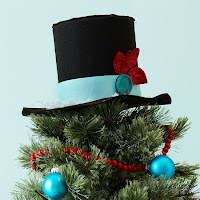 Wrap a light blue ribbon around a plain black hat; embellish with a button and a poinsettia bracht. Dust with a bit of fake snow, and put it on top of your tree for a fun and classic look. 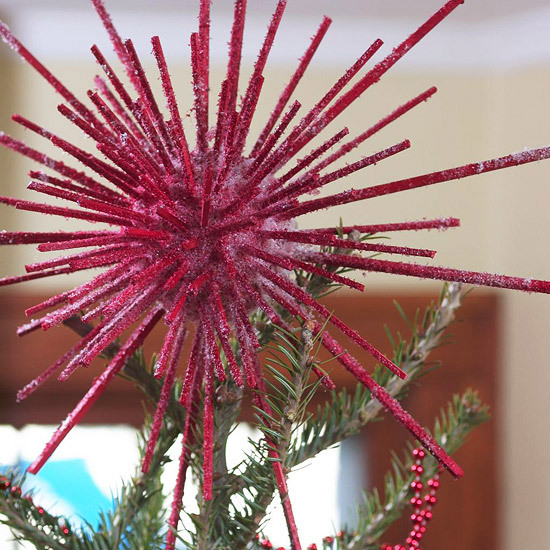 Make a custom tree topper by inserting narrow sticks into a foam ball. Spray-paint with the color of your choice. When dry, spray with spray adhesive and sprinkle with glitter. 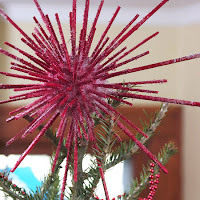 Tip: The topper will be most secure if one of the sticks is left long (about 18 inches) so it can be wired to a tree branch. Crown your tree at Christmastime with this easy-to-make tree topper. Measure a strip of paper to fit around the top of your tree. 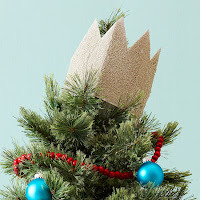 Cut out triangles on one edge to form a crown shape, then secure the paper edges together with a bit of tape or glue. Slip over the top of your tree to give it a royal look.